Take your game to the next level with these animations! 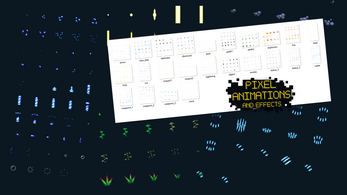 Nearly 100 animation effects are drawn in crisp and clear pixel-art that will work with retro styles. Weapon attacks from sword slashes to piercing arrows; elemental spells from fireballs to columns of water to lightning storms; subtle effects of dust and smoke to bring life to the world environment; and even and status effects for poison, blind, sleep, and more-- this collection of animations includes everything you need to make your game come alive! Each animation sheet has multiple animations-- over 90 animations in total! Combine frames to create custom unique animations in RPG Maker! Retro pixel art -- fits multiple styles, including OS Modern and Time Fantasy! Terms and License information: Commercial use is OK, no royalties required, no credit necessary, edits are allowed. Pretty much everything's fine except direct redistribution. The terms are detailed in the "pro license" used on GameDevMarket. What format are the animations in and what size are the made for (16px*16px, 32px*32px, etc)? Frames are 64x64 (also included are larger versions formatted for rpgmaker), and they come in spritesheets as well as individual frame .pngs. Awesome pack, love the art work and the animations look amazing. Just out of curiosity, how many animations are on one sheet, and how many frames does each animation have? It's kinda hard telling them apart. It's different for each sheet, so it's kind of hard to say. Also, some animations are designed for flexibility-- for example, multiple animations in a row could be used together for a longer effect, or used individually. I might write up some sort of guide eventually. Good idea! It is kind of hard to just drop and use these into a MV project. How do I set them up in the editor? I added a sheet and told it to do 15 frames (the fire one)for example, and no animation shows up when I click Play in the Animation area. Do I have to do something different to get it to work? There was no .json file either. 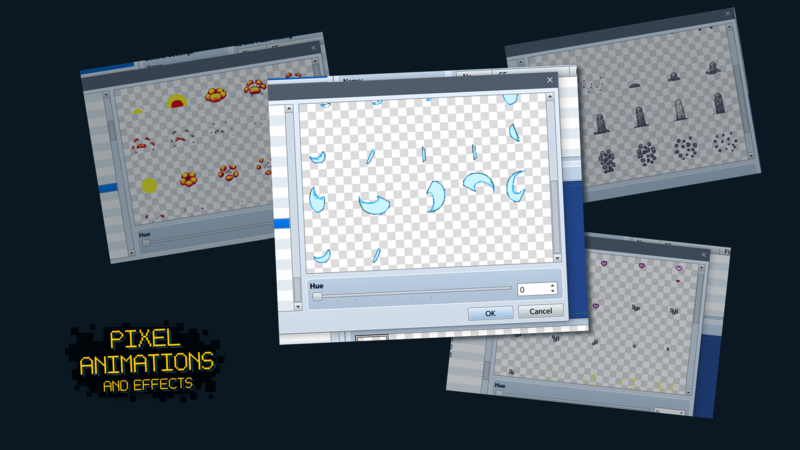 You need to create the animations in the editor using the frames from the animation sheet. There is an example in the discord channel in response to your question earlier today. Great pack! Can you please add the license to the More Information box? Is it possible to use it for commercial projects? Yes, commercial use is fine! Thanks! We're utilizing some of your assets in a project we hope to release for the switch. Great work! 1) What can I do with these effects? 2) Can I use these effects in a top-down fighting game I'm making as special skills? I have my characters charge and release states. If I can do this, how can I do these? 1. Lots of things! It's kinda hard to say, because they're designed to be versatile. They'd be mostly useful in fantasy combat situations, since the pack is focused on weapons and magical spells. 2. Sure. Not all the animations will fit perfectly-- but for the most part I tried to imagine how the animations could be used in turn-based battles and top-down action combat. A lot of the animations are variations of generic "impact" type effects, which would have use in lots of ways. Weapon animations are designed for use in traditional RPG battles as well as action-RPG combat. Frames can be flipped or rotated for further variety of application. Impact and effect animations, such as the smoke or dust clouds, should have a wide variety of uses, including as environmental detail. Some parts of animations can be used in combinations with other animations. Some animations can loop infinitely -- hopefully it's clear which ones are capable of this.